What about a flying wing, carrying 80 passengers over the Atlantic? Sounds 1930s, uh? But the concept was developed much earlier, in early 1920s. Dr. Hugo Junkers patented the Nurflügel (literally - "wing only") configuration in 1910 and subsequently developed a series of sea- and landplanes which weren't exactly "flying wings" but had large wing area. The pinnacle of this development was the J-G1 all-metal transport plane, scrapped in 1921 on the Allied Control Commission order. 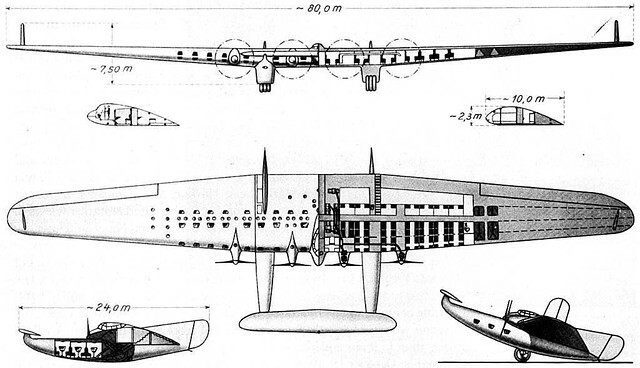 In 1920s, inspired by the Giant Seaplane idea, Junkers advised Ernst Zindel to start the design of a "giant passenger transport flying boat" under the name Junkerissime. Two designs were developed, a sea- and a landplane version. The seaplane design saw a double fuselage solution, where the two hulls were the integrated floaters. About 40 to 60 passengers should be carried in the two fuselages over a range of 1900 to 2200 km. Sounds familiar? The concept was implemented a bit later by Alessandro Marchetti - see Savoia S.55. The Junkerissime landplane version had also two fuselages, but the passengers were located in the wing area. The designs are more a study to evaluate the technological demand for the building of so large aircraft, than a real development project. They showed the future possibilities of commercial aviation. Another futuristic design was the J1000 aka Riesenente ("giant duck") developed by Dr. Otto Mader in 1924. This design was developed specially for Hugo Junkers' travel to the United States. Junkers and Zindel (Junkers Flugzeugbau chief engineer since 1922) presented the J1000 design as a future transport aircraft, which was also usable as a transatlantic aircraft for passengers. Routes over Iceland, Greenland and Canada were already discussed by Junkers. The design was a wing-only canard solution. Accomodation for up to 80 people were fully integrated in the wing. Individual sleeping cabins were also available for long range flights of 8 to 10 hours. The design was highly futuristic for its time and it looks uncommon even today. For his commercial presentations of the J1000 design, Junkers had prepared a model aircraft, as well as a lot of technical and art drawings. Also a mockup of the passenger areas in the wing were already built at Dessau. It is unknown, if Junkers and Zindel believed to present a realistic design for the mid-20s or if they just wanted to show what will be possible in the future. However, their U.S. discussion partners did not show particular interest in the J.1000 design and no further developements of this project are known. 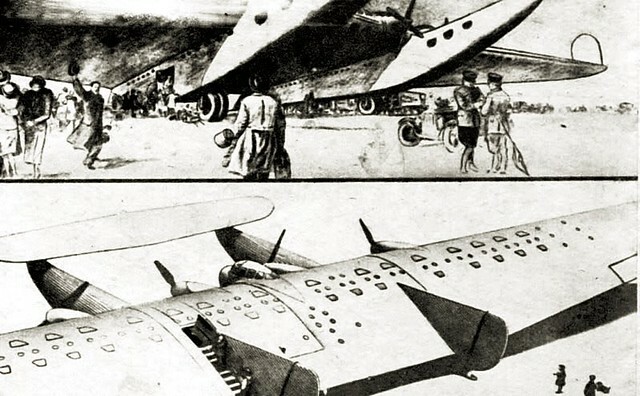 Nevertheless, a lot of concepts of the Junkerissime and the J.1000 were later used by Junkers in the G38 developement, which became the largest landplane of its time. Probably the Duck served a kind of inpiration for Geddes - he designed his #4 much later. Reminds me of the bel Geddes Airliner #4. Seems like it would be tough for the pilot to see to land with that big canard, although the view from the windows in the leading edge of the wing would be great. The side view looks awkward, but I do like flying wings.